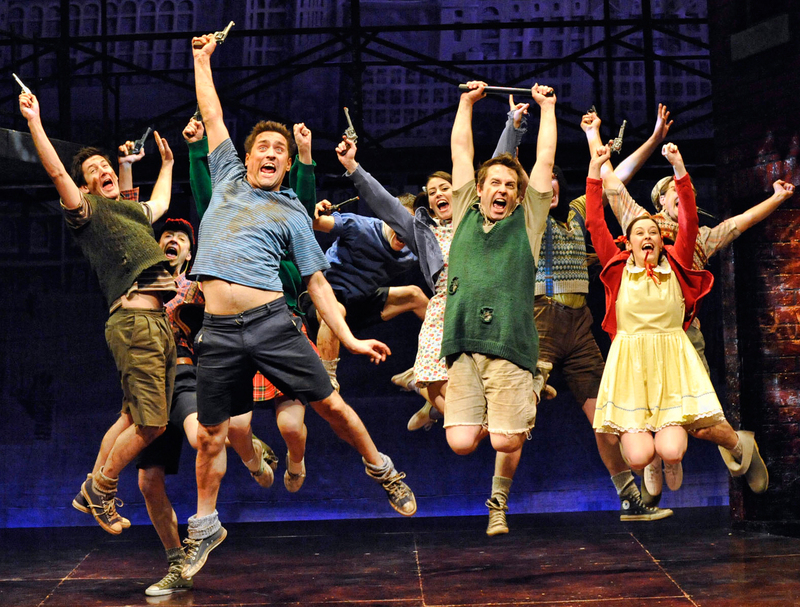 Despite perhaps not being as instantly synonymous as the likes of say Mamma Mia!, Les Miserables or much of Andrew Lloyd-Webber’s output, Blood Brothers is undoubtedly one of the big musical success stories of the past few decades both here and overseas, becoming the third longest-running musical production in West End history during it’s London run before embarking on a string of highly successful tours such as the one which this weeks arrives at the Wolverhampton Grand. Based very loosely on the ideas and themes of the Alexandre Dumas novella The Corsican Brothers but transposed to a distinctly English (see: Merseyside) setting and tale, Blood Brothers is a hearty, and indeed weighty, musical experience which brilliantly manages to be both somewhat epic yet also focused and intimate. It brushes upon melodrama, frequently plays with heightened foreboding and artistic ambiguity (in the form of a not altogether-detached narrator), dips into a broad spectrum of ideas and issues both social and psychological, and yet for all of this remains accessible, sincere and for the most part at least, a surprisingly jovial, good-natured and well-paced piece that feels it’s almost three hour running time for all the right reasons. This is heavy, investing yet undeniably entertaining musical theatre that seems to have come via the Les Miserables school of emotional hard knocks, taking you on the tour de force of highs and lows on a grand yet decidedly human yarn populated by believable characters and all-too familiar problems writ large. Blood Brothers follows the story of two twin brothers reluctantly separated at birth by their mother due to financial hardships, growing up unaware of their bond yet seemingly destined to continually be brought together by it. From practically the outset the show imbibes ideas of superstition, destiny and fate, the initial deal done to separate the boys in giving one to an affluent woman unable to conceive to herself depicted as a secretive ‘deal with the devil’ of sorts; a debt that will have to be repaid through madness, guilt and loss, and with gestures and foreboding such as this delicately prods at the idea of circumstance versus destiny or the like throughout. As mentioned, this is anchored by the presence of a near-omniscient narrator who somewhat eschews convention and becomes more an arbiter of judgement and a figure of inference and foreboding as opposed to any particular explanatory or expositive purpose. It’s an effective and at times somewhat eerie formula, particularly when coupled with the likes of a characters gradual descent into mental instability in the first act and worsening temperaments and heightened tensions in the second. 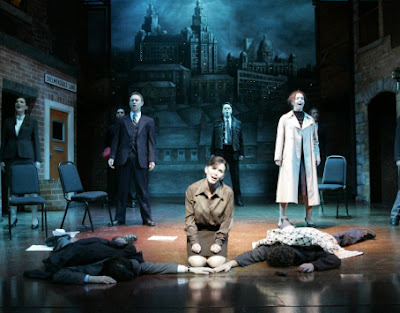 As mentioned though, for all of its darker hues and dips into more serious dramatic territory, Blood Brothers balances its overall tone masterfully and goes on a neatly defined journey. The earlier scenes with the brothers and their childhood escapades are wonderfully inventive and capture the zeitgeist of youthful innocence and daring perfectly. Indeed much of the first act in particular ventures into social realism territory with the occasional nuance of Mike Leigh and kitchen sink, or even Enid Blyton with it’s celebration of the youthful status quo (though thankfully with a bit more bite and scouse vim). Coupled with this we see the parallel lives of the boys respective mothers, each struggling with their own troubles and daemons, before segueing into a second act where puberty and adulthood kick in and, of course, relationships (and indeed characters) deteriorate, problems escalate and the earlier foreshadowing gradually becomes a stark reality. Throughout all of this, it is easy to at times find yourself forgetting that Blood Brothers is in fact a musical, as not only do considerable lapses in time pass without a number, but the show as a whole adopts a fairly subdued and sophisticated approach to its music. With a notable lack of major set pieces or showy numbers (even the act one closer is a jovial but breezy affair), the use of music is mostly to enunciate or punctuate the characters or the drama on-stage, and occasionally remind us of the implacable darkness to come. Character and sentiment is nicely perpetuated or articulated, with the boys mother Mrs Johnstone repeatedly comparing her life, both it’s highs and lows, to that of Marilyn Monroe, whilst a comparative number between the two young boys is a spritely, laddish bit of banter and typical childhood thinking merely elevated to song. There’s no prerequisite choreography, some of the numbers last merely a few lines, and there’s a scope from full orchestration to more minimalistic or even retro accompaniment. It’s certainly a unique, canny and considered soundtrack, and despite the relative scarcity of musical numbers, they are so carefully judged and do a wonderful job of further realising the heart and core of what we are seeing on stage that there’s little doubt the production and the story it seeks to tell would be diminished without them. Like any musical, much of the heart and soul of Blood Brothers is nestled within its score, only with a little more subtlety and integration than most musical productions manage. The current UK tour is able to boast a cast mostly experienced and familiar with the show already, be it in the West End, touring or abroad (and in the case of some cast members, all three!). Maureen Nolan showcases some strong vocals and puts in a heartfelt, moving turn as Mrs Johnstone, lending her interpretation of the character something of a forlorn weariness and regret - a woman almost consigned to the hardships of life and old before her time due to the hand that’s been dealt to her. Sean Jones is superlative as the under privileged brother Mickey, putting in a remarkably transformative and progressive performance from boisterous boy of seven (nearly eight) through to the trials and troubles of teenage and adult life, brilliantly and visibly devolving into a husky, graveled shell of his former self. It’s a terrific, powerful turn and one that is beautifully met by the almost equally versatile and engaging performance of Olivia Sloyan as the boys mutual friend and potential sweetheart Linda. Mark Hutchinson portrays Eddie, the twin brother given up to live a more well-to-do life, and gives an endearing, charismatic turn that perfectly conveys a foppish charm and naivete without descending into typical snobbery or Eton-esque archetype. Of the two brothers Eddie is certainly given the least in the way of powerful moments and weightier drama, but Hutchinson ensures he remains an empathetic and engaging figure throughout. Tracy Spencer puts in an impressively controlled yet still evidently unhinged evocation of Mrs Lyons, Eddie’s adoptive mother, who almost immediately begins to unravel and despair with the deception and paranoia of his parentage. With an impressive cast, a sweeping story that is both delicate and devastating, and a sophisticated use of musical numbers as a means to expand upon its narrative and characters, Blood Brothers is a memorable, moving and involving piece of theatre. It seems lazy to say it has something for everyone, as that can hardly ever be true, and indeed this is a show whose length and focus on character as opposed to spectacle will likely mean it will not engage all ages and audiences, but it remains nonetheless a wonderfully charted and captivating ride of highs and lows; you will laugh, you will smile, you will be shocked, you will be moved, and, judging from the reactions of almost everyone in the audience around me, you very well may find yourself crying as well (I didn’t... that was an unfortunately time speck of dust in my eye, of course). If I were to apply any critiques, then in being born of such a tried and tested narrative, and with it’s conclusion signposted from the very beginning, some of Blood Brother’s deviations, subplots, characters and message can seem in places a touch derivative or familiar, and occasionally some of the dialogue and imagery can get almost preachy and even parodic, but this is a story and production were the journey is most certainly the destination, and if truth be told despite these very pedantic nitpicks, what a bold, brilliant and wonderfully crafted journey it is. BLOOD BROTHERS is running at the Wolverhampton Grand Theatre from Monday 29 April to Saturday 4 May 2013. Press tickets for this performance of BLOOD BROTHERS were provided courtesy of The Wolverhampton Grand directly. (A)musings Media gratefully acknowledges their generous invitation. Wow your review is pretty advanced stuff. Nicely written, it sounded like a real exploring of the show and not just a review of this version of the show. Really enjoyed reading it! I saw nicki evans play mrs johnston back in london and she was sensational, I'd like to see maureen nolan just so I could compare the two, its a great role! PS thanks for the link to this on twitter! Thanks for your comments - we try to make sure the reviews we put up are as in-depth and exploratory as possible without ruining too much of the experience of seeing the show. I've personally heard a lot of great things about Nicki Evans in the role - here's hoping she returns to it one day in the not-too-distant future and we can review her as well! Glad to see the twitter linking is getting people over to the reviews - we really want to start growing our social media soon so please feel free to re-tweet/favourite etc. and share on facebook!